As usual, some bla bla in the beginning – you may skip directly to the guide. Some of the links are German – I could not find English versions, sorry! Compared to the simple concepts of IPv4, I still struggle a bit to understand the IPv6 concepts in detail. But Unitymedia, my ISP, only offers DS-Lite (and receives lots of bad publicity for it), and thus forces you to have a look on IPv6 concepts if you at some point want to go beyond simple internet surfing. Still, they don’t make your life easy, delivering cable modems that are – to put it mildly – a bit overrestricted, lacking funtionality that you would expect, and which the hardware itself even would be able to provide. I am speaking of the infameous Technicolor TC7200 cable modem – Unitymedia edition -, but as far as I understand (and partly can judge myself), the Connect Box is not really better. On of the severe problems is that the TC7200 supposedly does not support prefix delegation, which is a crucial feature. I did not understand how crucial that is, until I started playing around a bit naïvely. I thought: Well, just pick a valid subnet and distribute it yourself, and things will work. I was not aware of the fact that the cable modem/router needs to actively issue the prefix in order to be willing to route traffic from and to it. 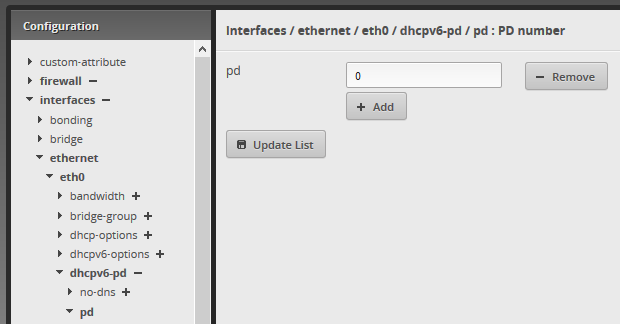 The WAN interface – in my case eth0 – is the one to receive the delegated prefix from the upstream router, i.e. the cable modem. So we need to give it a number to identify the requested prefix. I chose 0. After that, you configure the desired prefix length. The router will ask the upstream device for a prefix of this length. What exactly you can get depends on your ISP. Trying around, 62 bit length seems to be what Unitymedia is willing to hand over. In the end, you want clients in the LAN to get IP addresses from the delegated prefix. Here you can select the interfaces that shall allow clients to pick an address. In my case, it’s switch0 that consists of three router ports. 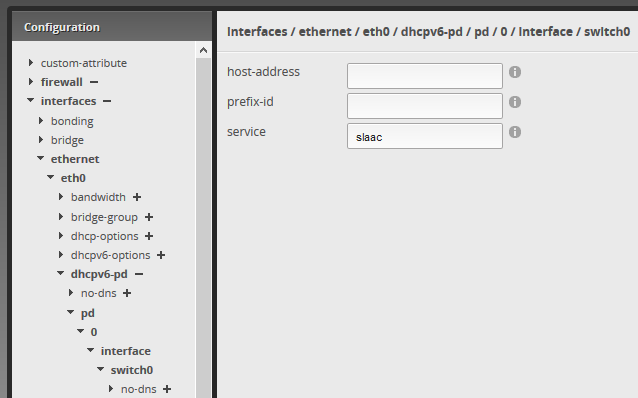 With IPv6, you can run “classic” DHCP, where the DHCP server decides which IP address a client gets. Alternatively, you can use Stateless address autoconfiguration (SLAAC), which I understand seems to be the more modern way to got. The client itself will generate an IP address from the offered subnet, will check if there is a duplicate, and if not, keep it. So I configured slaac as service. I’ve still some questionmarks – it seems that the DNS server is not handed over alongside – it still comes via DHCPv4. 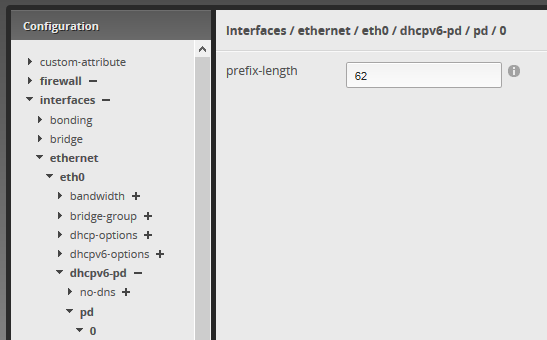 As of now, it does not bother me, since the DNS via IPv4 can still answer AAAA queries for IPv6 addresses. I cannot tell if this is strictly necessary for things to work, but I left it since it seems to make sense to me. Doing the above steps will cause several other values to be set to defaults. Click around in the Config Tree, you’ll see what I mean. It may make sense to play around a bit here. Do not forget to make sure you have an IPv6 firewall configured! The IPv6 addresses that you just brought into existence are globally routed and thus open to attackers unless shielded.